MASTERS MEET: It was a big night for San Gabriel Valley pole vaulters and 200-meter runners. Four athletes from both events advanced. Walnut’s Kayla Richardson and Damien’s Thaddeus Smith and Zach Shinnick all qualified in three events and Diamond Ranch’s Daniel Stokes qualified in two events. Weiss and Jett were the only jumpers to clear 15-9. Neither made 16-3. They were given an additional attempt at that height to break the deadlock and both missed. Weiss then cleared 16-0 for the first time in his career and Jett missed. TO SUM IT UP: Get ready for a great day of baseball on Tuesday. Walnut, which has a 17-game winning streak, will take on USA Today’s No. 1 and undefeated San Dimas (31-0) at San Dimas for a right to play in the D-3 championship. 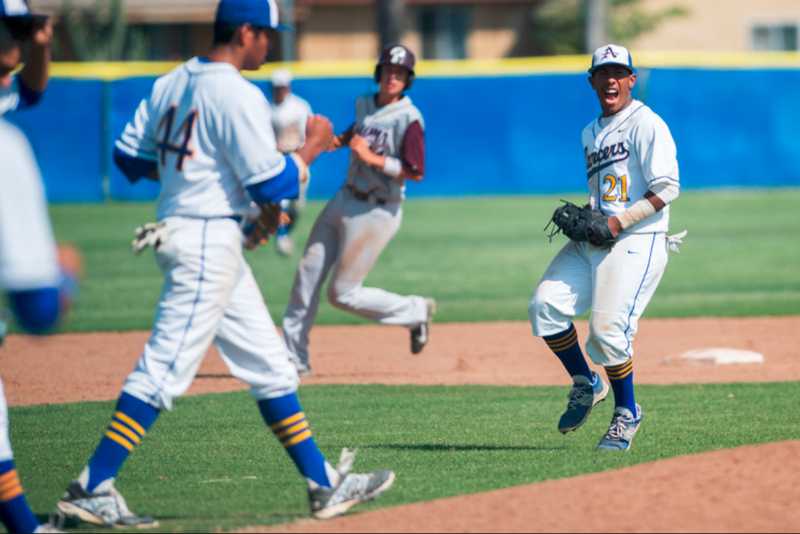 If Bishop Amat can beat Redondo Union at home, Amat would get the winner in an all valley final. Walnut at San Dimas, 3:15 p.m. DEFENDING CHAMP AMAT IN SEMIS: Bishop Amat coach Joe Hoggatt had the difficult task of replacing Andy Nieto, who not only won four championships to keep the tradition going at Amat, but Nieto won it last year with a team few expected could win it, then resigned and later took over at Damien. It has been a bumpy ride for the first year coach, but during do-or-die time in the playoffs, Hoggatt and his boys are doing just fine. Bishop Amat held on for a 3-2 upset over third-seed Paloma Valley on Friday to advance to the CIF-Southern Section Division 3 semifinals, where it will host Redondo Union, a 6-3 upset winner over second-seed Palm Desert, in Tuesday’s semifinals. It was Bishop Amat’s (17-12-1) eighth straight playoff win dating back to last year, and Hoggatt choked up when asked what it means to be the next in line to keep the tradition going. SAN DIMAS PERFECT 31-0: The record-breaking unbeaten San Dimas High School baseball team was taken to the limit Friday afternoon in a CIF-SS Division 3 quarterfinal game and defeated host Santa Monica, 1-0, behind the three-hit pitching of senior Peter Lambert. The Saints (31-0) advance to their second semifinal in the last three years and will host Walnut, a 5-2 quarterfinal winner over Quartz Hill, on Tuesday. 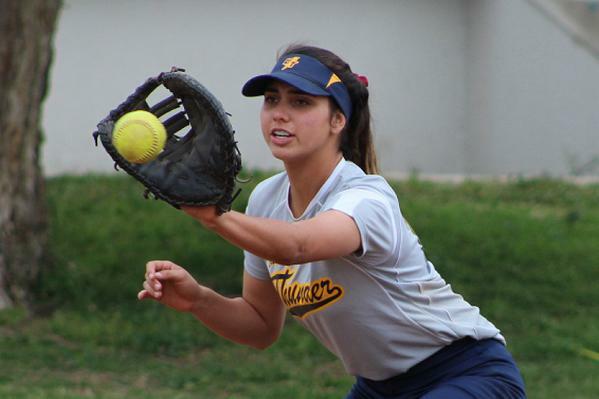 After amassing 26 runs in their first two playoff games, the Saints managed just four singles and a lone run against Santa Monica, but nonetheless the march toward a second CIF-SS title in the last six years is just two wins away. Mission Viejo at South Hills, 3:15 p.m.
La Serna at Bishop Amat, 3:15 p.m.
St. Bonaventure at San Dimas, 3:15 p.m.
AMAT MOVING ON: Bishop Amat held on for a 3-1 victory over San Clemente to advance to the CIF-Southern Section Division 3 semifinals for the first time since 2012. But not before a brief scare. 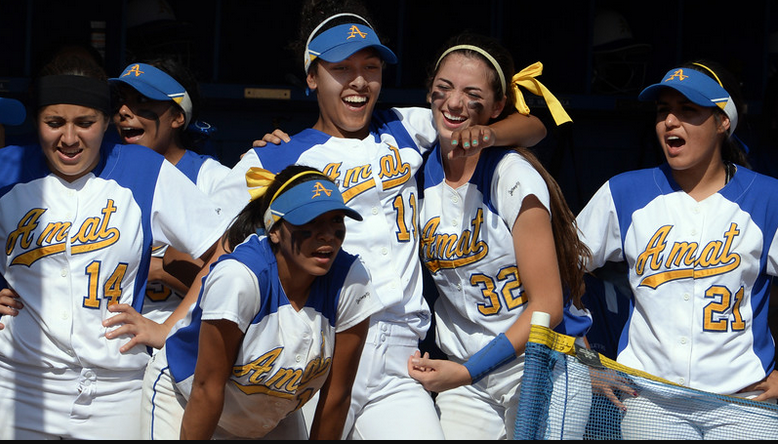 Bishop Amat trailed Burbank 3-0 in the second round and scored four runs in the bottom of the seventh for a miracle comeback to reach the final four. That was the lead Bishop Amat had over San Clemente heading to the seventh, so when San Clemente’s Mikaela Mak led off the seventh with a single followed by Kelsie Horton’s double off the fence, Lancers centerfielder Alyssa Barrera started thinking the worst. LUGO LEADS SOUTH HILLS: Two very good young pitchers faced each other in the quarterfinals of the CIF-Southern Section Division 2 softball playoffs Thursday afternoon at Agoura High School. South Hills, led by sophomore Natalie Lugo’s game-high 11 strikeouts, defeated host Agoura 6-1 and will return to the semifinals for the first time since 2011. The reward? A date to host top seed Mission Viejo (28-0), which is, according to USA Today, the top team in the nation in the Super 25 softball rankings. San Dimas 8, Mary Star of the Sea 2 — Lindsey Hughes struck out nine and Brooke Jackson went 4 for 5 to lead the Saints (21-9) to the CIF-SS Division 5 semifinals. Also contributing to San Dimas’ win were Shelbie Moore, who went 4 for 4 with two RBIs and two runs scored, and Carlie Salm, who had two hits and two RBIs. The Saints will host St. Bonaventure on Tuesday. #PRAYFORDANA: Etiwanda High School softball standout Dana Housley passed away Wednesday, four days after suffering a brain aneurysm on the field. Coach Dave Masucci, also the school’s athletic director, confirmed the news.Her father, Larry Housley, made a statement on Facebook directed to everyone who was praying for his daughter’s well being. 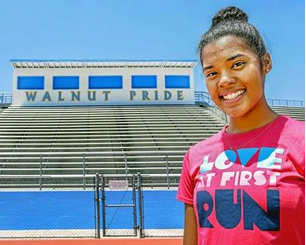 WALNUT SPEEDSTER SET FOR MASTERS: Kayla Richardson has finally stepped into the unknown. 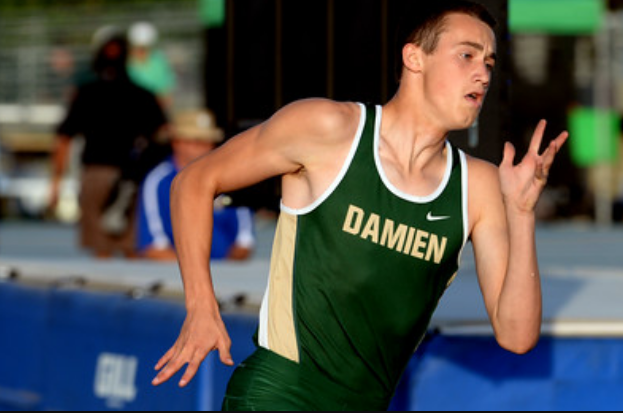 he Walnut High School sprinter was expected to set foot in the final CIF-Southern Section track and field meet of the year, the Masters Meet, for the past two seasons, but a hamstring always managed to get in the way. Not this time. The junior will be making her first Masters appearance as an individual in Friday’s meet at Cerritos College in Norwalk. Richardson has qualified in the 100- and 200-meter races. ECHOLS TO CAL: One visit and Zion Echols was hooked. That’s how the Charter Oak High School football standout felt about Cal and soon after setting foot on the Berkeley campus he was tweeting out to followers that his mind was made up. Echols gave a verbal commitment to play at Cal this past weekend during a visit to the Bay Area, thus ending a recruiting process that saw the all-purpose threat pick up offers. LOVE SUFFERS NECK INJURY: West Covina defensive back Isaiah Love is in danger of missing his senior season after suffering a serious neck/upper back injury during a trip to the Bay Area on May 16 for an unofficial college visit. Love was with Body By Tra, a workout club/7-on7 team owned and operated by Traison Lewis, on what was supposed to be an unofficial visit to Cal and San Jose St., and possibly a performance in that weekend’s Nike Camp in Oakland. Instead, the van the team was traveling in was involved in an accident that saw several passengers end up hospitalized. Love wound up with a hairline fracture of one of his vertebrae’s and will be in a neck brace for eight weeks. The first specialist who saw him, according to Bulldogs coach Mike Maggiore, said that Love won’t play his senior season.